Mums share their stories of babies born on the way to hospital! While our toddlers like to give us cause for stress on a regular basis (climbing on the table, running towards the road or finding the sharpest object in the house to play with) some kids just can’t wait til toddlerdom to cause that much drama. We asked Babyology mums to share their heart-racing stories of babies that came so quickly, they didn’t even make it to the hospital. 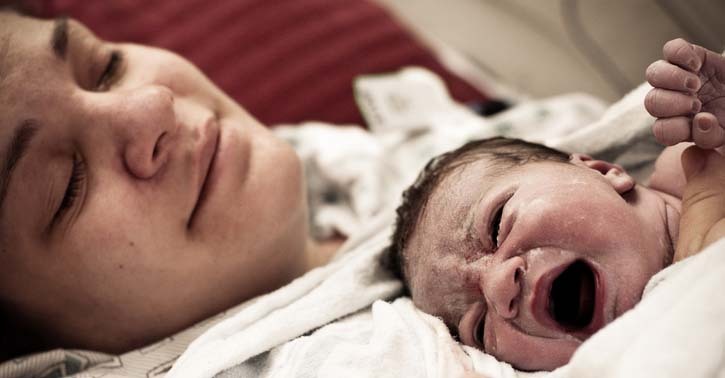 I had my son on the bathroom floor three hours after my first contraction. Was just about to leave for the hospital when my waters broke, and after that, I wasn’t walking anywhere. Delivered him myself because hubby and mum were rushing around calling an ambulance and running after our toddler and didn’t realise he was actually coming out! He’s a perfectly healthy 9-week-old now! I gave birth to my son at home all on my own. My husband left two minutes prior to drop our son at my mother in law’s around the corner, we were planning to go to the hospital as soon as he got home. He was literally gone six minutes and got the shock of his life when he got home. Luckily everything went well and he is a perfect little 6-week-old. Paramedics really are exceptional people. They safely delivered my speedily arriving son on my bathroom floor and I’ll be forever grateful. Thank goodness it was my third child so I knew roughly what I was doing! I live 10 mins from the hospital. As I was walking to the car to go to the hospital my water broke and my contractions were so intense I couldn’t stop the pushing urge. My partner was rushing to get me there, but my baby boy’s head was out as we pulled into the emergency area. My partner ran in to get help and I was in the car trying to take my boxers off and hold his head. Six nurses ran out and one lady opened the door, grabbed my ‘lil man and passed him up to me. Well, I didn’t even make the end of the driveway! As the paramedics were wheeling me out of my house this caused my waters to break and my daughter was delivered just as I was placed inside the ambulance. I guess she didn’t want her daddy to miss her arrival as he was looking after the other kids. My brother in law’s car broke down while taking my sister to the hospital and he had to deliver the baby on the side of the road. A policeman pulled up and were going to fine them until they realised what was happening and called an ambulance. Did you have a quick birth as well? Tell us your story.